Need more than 2 cameras? With the 4 channel fleet camera system, you get the ability to add 2 additional cameras to your system. Connect to your WI-FI hotspot and you can now have a live streaming fleet Camera System. Use them inside your delivery box. Outside of your long haul truck, on the fenders to see down the side of your Rig. use one as a backup camera. One on the right side of your box truck to remove those “blind” spots. Full recording for all 4 cameras in 720p HD. In today’s rough economy, having the power to track your fleet vehicles, and also ride along with your drivers are valuable resources. The necessary electronics were once too pricey to be an advantage for small business owners, but now the 4 Channel WI-FI fleet Camera System from Safety Track Cameras makes this precious resource cost efficient with highly agreeable return on investment. Check out the accessories available for this camera or try our new Software Demo that allows you to preview sample camera data. This 4 camera fleet system is easily installed and then you can view what the driver sees using the front camera, but also discover what the driver is doing while operating your fleet vehicle. Along with choices of seeing the side of the car or out the back window, or other possibilities of camera angles and choices are available. Are your drivers watching their phone instead of the road? Sending text messages while driving is now known to account for more accidents than all other driving related mistakes. Each day’s information is saved to an SD card that may be removed from the camera and inserted into your computer. If you don’t like the hassle of retrieving the SD card, a WIFI adapter is available that can automatically download alerts to your computer. Know the habits of your driver: harsh accelerating, hard braking, breaking speed limits, or any other driving mistake our 4-Channel Camera can help to prevent and give your fleet vehicle a longer life. Smallest stop arm camera in the industry! With the dual SD card slot, you can either mirror the first SD card or run them in tandem to get up to 512GB of storage. With Insurance rates going through the roof and fleet safety always a concern, you need to know exactly what your drivers are doing on the road. Event based recording are good, but only show you when something has happened. Now you can watch and see who are ou best drivers, before something happens. This System was made for various size fleet and services. Adaptable to serve as a workhorse in an environment like yours. We have seen dramatics resultsfrom lower accidents and frivoulous insurance claims to driver accountablity and improved safety. 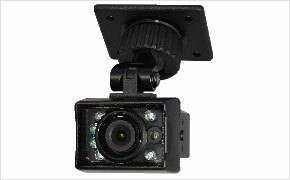 Add ing a fleet camera system will pay for itself in a short amount of time.